In this tutorial I will demonstrate you what Rest is and how to develop a simple rest web service in java using jersey. Before moving forward let see what rest is. It relies on a stateless, client-server, cacheable communications protocol which uses HTTP protocol. REST is a simpler, lightweight alternative to RPC (Remote Procedure Calls) and Web Services (SOAP, WSDL, etc). Know more different between Rest and SOAP. 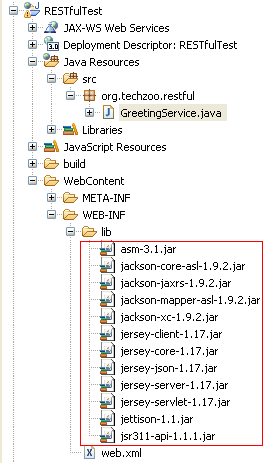 I will use sun’s JAX-RS reference implementation Jersey to demonstrate simple greeting service. Create new Java EE project in eclipse and add all dependent jar files in classpath. You can download related jars from https://jersey.java.net site. Here you can see web.xml contain one servlet named ServletContainer which has url pattern associated to it. Now write one class which is our main REST web service class. This REST based web service will be accessable using following URL.